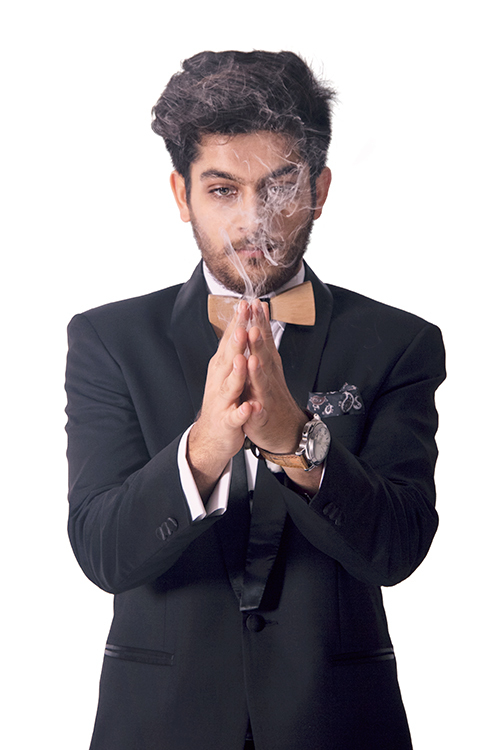 Black tuxedo, black trousers, wooden bow-tie, pocket-square, all from SS Homme; white shirt and watch, Neel’s own. It will happen in a few years. Well, it definitely has its perks. I get to travel all around this beautiful country. There’s also a lot of responsibility as I’m representing the Indian magic community at not only national but international levels too. David Blaine, Dynamo and Derren Brown. It’s funny how now people have started comparing me to them. Shatrunjai Dewan of electronic outfit Paraphoniks, Vishal Verma from Superstar Weekly and Rahil Badhwar because he knows all of my secrets. I nailed it! Obviously, learning never stops, so I always give it my all. Dinner…without the wine. I come from a non-alcoholic family. I’ve had a deal with my dad. I become a magician, and then do my MBA…so after my graduation from H.R. College of Commerce and Economics, that needs to be done. Other than that, I’m working with people from around the world to bolster the image of magic in India. More television. A one-man mentalist theatre show. A lot on the digital platform and a book.